Been looking for a hairstyle routine that has the potential to keep your curls tight and bouncy up to four to five days? Look no further! Curlies everywhere have been utilizing what is called the tightly curly method, invented by Teri LaFlesh, author of "Curly Like Me," in order to achieve just that. The method is based mainly on using any type of conditioner as a leave-in conditioner. While it may seem a little odd to leave a rinse-out conditioner in your hair, the method has many curly-haired women raving about the results. So join the bandwagon, find out how to use the tightly curly method properly and become one of the raving fans. Since curly hair is so different than straight hair, extreme care must be taken when cleansing. This means that you should be washing your hair gently, focusing more on the scalp area. Most curlies only need to shampoo once—aka, no rinse and repeat—and when finished, rinse the shampoo out. Once this is completed, you can use a light low-cost conditioner. Apply a generous amount to your scalp and squeeze it down to your ends. A lightweight conditioner will make the hair slippery, allowing for dirt to cling to it. This way, when you rinse it out, you will rinse out more dirt, leaving you with cleaner hair without over shampooing. Some curlies, however, may not even need to shampoo. The no shampoo method works well with the tightly curly method as well. Keep in mind, however, that if you have recently worked out, you should wash your hair in order to rid it of sweat and dirt, despite you individual hair type. You need to use a lot of conditioner in order to make the tightly curly method work. Pour out a big handful and apply it to half of your hair, concentrating on areas other than the scalp. 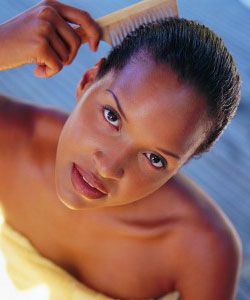 In order to allow the scalp to breathe, apply conditioner about two inches away from the roots. As you are applying, you should be able to feel the conditioner gushing around your fingers. If this is not happening, you need more conditioner. Once you are done with one half, do the same for the other half. Use a large toothed brush that has a lot of give, as curly locks often can be damaged by finer toothed combs. While brushing, you will notice that the conditioner is producing a lot of foam, but by the time you are done, this foam will disappear as the conditioner settles on the hair. Keep in mind that your hair needs to be soaking wet while you are brushing. Wrap strands of hair around your fingers in order to define curls. Avoid blow drying as this can cause damage and frizz. Instead, let the hair dry naturally. If you're feeling impatient, you can speed up the drying process with a little help. Once it is dry, don’t brush or comb it. Rather, separate it gently with your fingers. If you want to refresh the look between shampoos, simply wet the hair and apply more conditioner. In order to help maintain the look, sleep in braids. This will help to hold the curl pattern and style in place. Also, if you haven’t yet invested in a satin pillowcase, you definitely should! Cotton pillowcases pull at your hair and can cause frizz, split ends, uneven curling, and more. You don't want to spend all of this time on the tightly curly method just to have everything unravel while you sleep.